The DD program JANNE KA HAQ is the only Television program in India,- or perhaps in the world,- which is working for over nine years on RTI and transparency related issues from January 2006. It has been taking up various issues relating to Right to Information every weekend. Despite it being a DD program, it had consistently championed the cause of transparency. Its popularity was high specially in rural areas and small towns. It highlighted RTI successes and failures and was one of the important contributors to the empowerment of citizens in the direction of converting our nation into a participatory democracy. Most institutions of power have been uncomfortable with RTI since the most powerless individual gains the power to challenge arbitrariness, wrong doing and corrupt actions. This challenges the arrogance and ego even of those who may be honest, apart from threatening the corrupt. Responding to this, former Central Information Commission and an RTI activist Shailesh Gandhi told, “Many of us had expected the government and other agencies in the country and the world would recognise and celebrate the occasion when the program completed 10 years in January 2016. There has been a hardening of attitudes in all the institutions of power against RTI. The opposition to this sudden empowerment of the ordinary citizen,- which is deepening democracy, and making it more meaningful,- is being opposed in various ways. Write to the I&B minister and the PM to continue this program. Recognise and award this program for its contribution to our democracy.. 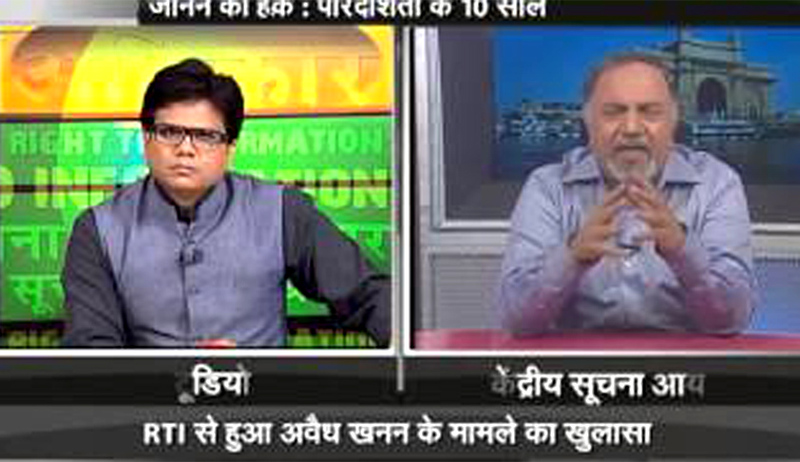 Persuade other TV channels to introduce and sustain programs on RTI. We need to act to defend RTI and our democracy”.